President, Comprehensive Eye Care, Ltd.
"An excellent, well organized and friendly team. Your service is impressive with professionalism. I'm very happy working with you. I'll certainly be submitting different manuscripts to you in the near future. Thank you very much for your kind support." "我有 3 次作为通讯作者在德孚医药出版社麾下期刊《Drug Design, Development and Target（DDDT）》发表文章的愉快而难忘的经历。每当我向期刊或出版商提出问题或请求的时候，总能够得到及时和令人满意的回复。网上投稿系统非常容易操作，一看就懂，只需几个点击，便可搞定。文章提交 1 个月左右就可以收到非常中肯而有建设性的修改意见，接受后 2-3 个月之内就能发表。尤其是编辑们的工作非常出彩，阅读通过他们编辑的文章是一种享受。在此向 DDDT 编辑团队、德孚医药出版社的朋友，以及尊敬的文章评阅人表示衷心感谢。感谢你们为作者提供了一个快捷、方便的展示自己研究工作的平台。如果有作者要发表文章，德孚医药出版社麾下的期刊是一个不错的选择。"
"Thank you for your excellent editorial work. Meticulous, speedy and very good communication." (International Journal of General Medicine). "I am very impressed by the quality of the review, very useful to improve the manuscripts. Many thanks to all the Dove Team and the Editorial staff for their prompt feedback and efficiency, and for their professional support and assistance during all steps of the publication process." (International Journal of Nanomedicine). "Two thumbs up for an excellent job well done. I was very impressed. The total article views are now 655 (13 days since it went online). I am looking forward to when the article is posted in PubMed. It will be interesting to see the responses. Congratulations are in order to the staff for their professionalism." (OncoTargets and Therapy). "It was a great pleasure and experience to publish in Clinical Ophthalmology. For me, the fast and thorough review and editorial system are remarkable. 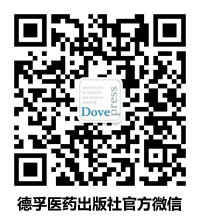 The friendliness of the people working for Dove Press at different levels of the publication process is extraordinary. Hope you will keep up the good work in availing scientific information to the world." (Clinical Ophthalmology). "Very professional and efficient publication process". (Research Reports in Clinical Cardiology).